That means many things at my house. Mr. Quirky always makes a brisket sometime over the weekend. And it's quite good. It means watching fireworks without a crowd. I'm a lucky duck and live in a small community with a fantastic fireworks show. The fireworks explode over Lake St Clair. We sit on the banks of the lake, or across Lakeshore Drive on the ample sidewalk and easement. The fireworks finish and if we drove we are home 15 minutes later. If we walked we are home 20 minutes later. Either way it beats the heck out of the time we did the Detroit fireworks and got home 3 hours later. Too much work for an extra 5 minutes of fireworks. And it means I get a new round of questions about my How To Make An American Flag post from 2012. 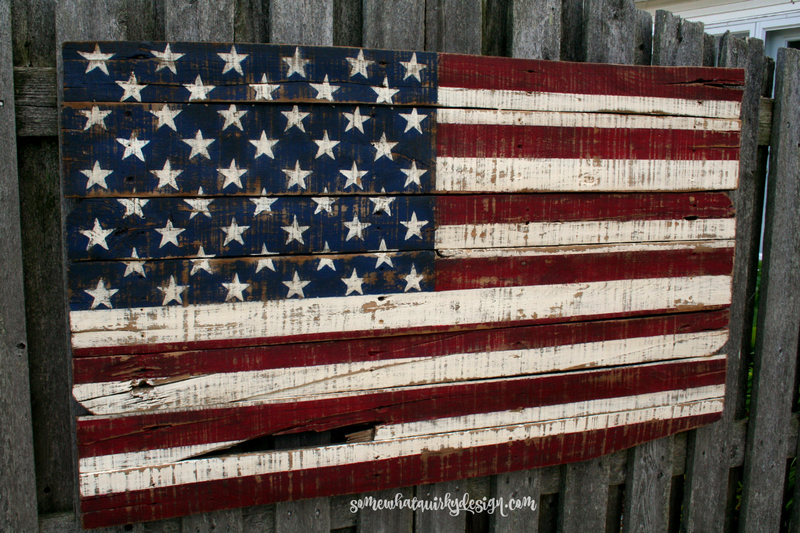 I made this really cool HUGE flag from fence panels that I picked up on trash day. And while I felt like I gave the best tutorial ever, and it was pretty good, there are things that aren't completely clear or are left out. 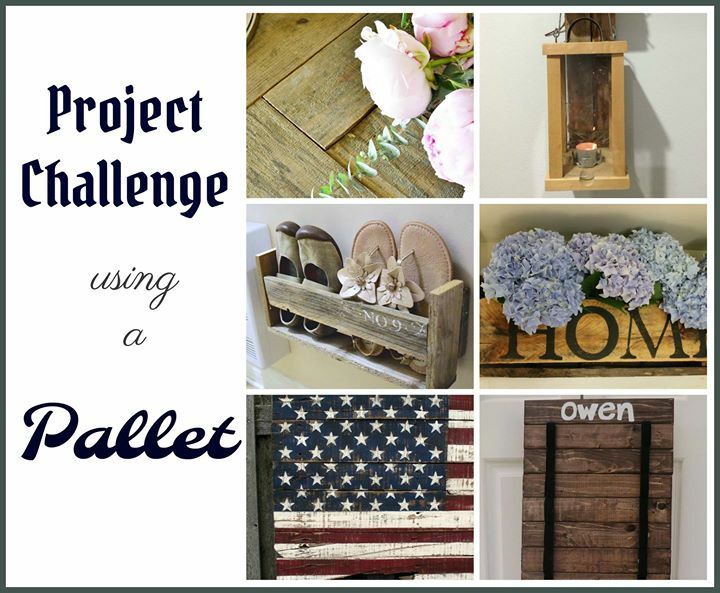 So when I found out that the June Project Challenge material was pallet wood I knew I had to make another flag and give the tutorial another try. Perhaps between the two tutorials you will find all the information you could ever want about building an American flag. So lets talk flag anatomy. A lot of pallet flags are out there. Some are anatomically correct and some are not. I choose to make my flag a close copy of a real flag. I have something in the works that is a "flag inspired" project. So I'm not biased to anatomically correct flags. The one's I've made a quite large and can easily fit 50 stars and 13 stripes so that's what I put on them. I do not know the true proportions of a real flag - by that I mean the ratio of height to width. I just add boards to the height until I think it looks "right." 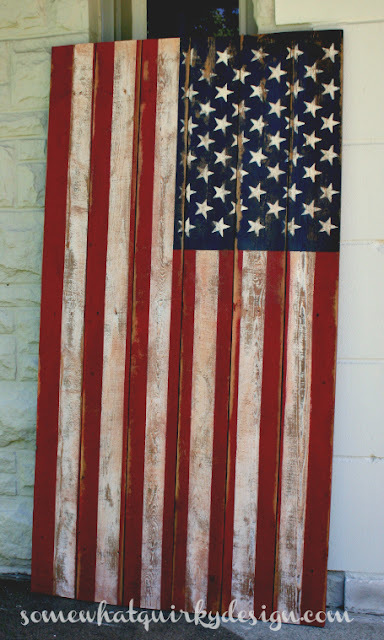 gather enough pallet boards to make your flag the size you want. They need to be close to the same length, so cut down any boards that are too long. Cut furring strips (that's the fancy name for a 1x2) to fit the horizontal height of your flag. Notice in this picture I used parts of the pallet for this instead of furring strips. 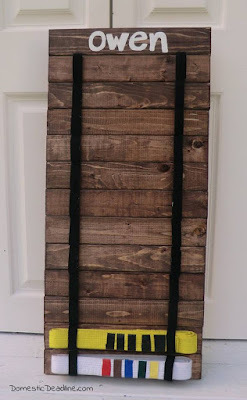 If your flag is going to hang it is probably best to use the furring because it is very light compared to the parts from the pallet. If the flag is lighter it is easier to move around - less awkward. 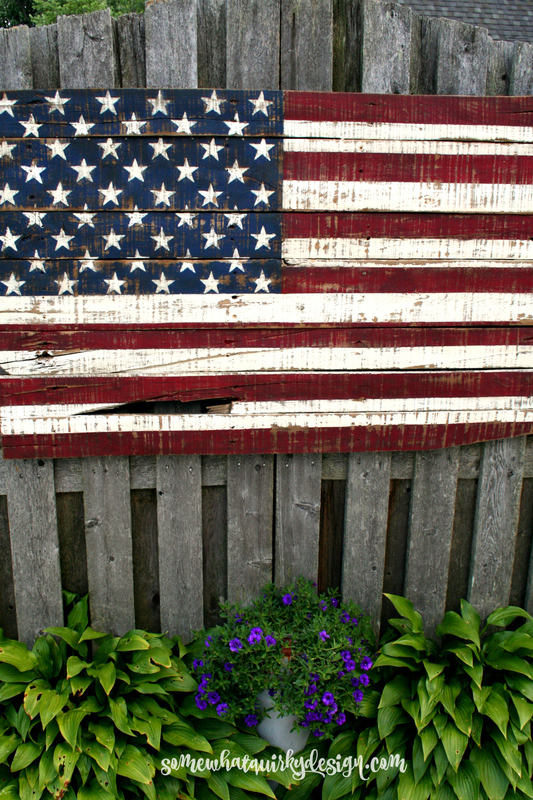 If the flag is going to sit somewhere, say on your mantel, or outdoors somewhere, it is probably best for your flag to be heavy. Attach the pallet boards to the strips with screws or a nail gun. Create the face of the flag. Measure the face of the flag. Divide the height of the flag by 13. This is the measurement of the stripes. 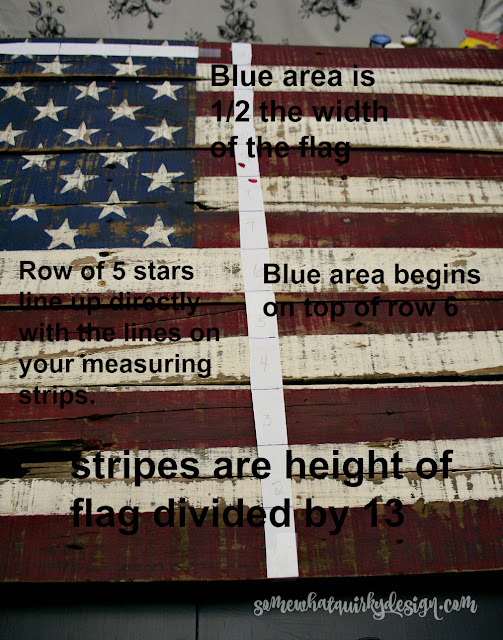 Lay out a strip of paper the size of the height of the flag. Measure out the stripes on this piece of paper. Make a second strip identical to the first. 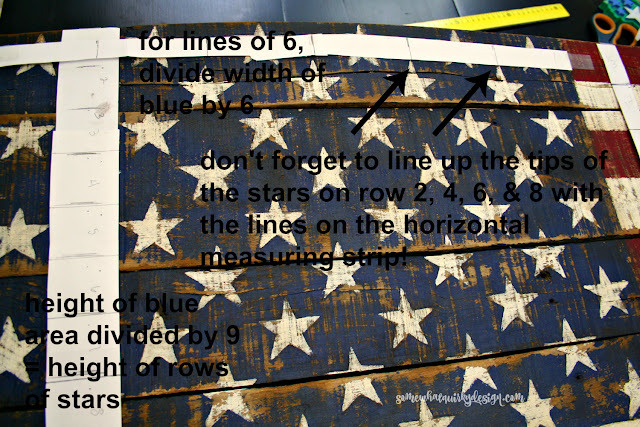 Tape these strips on the flag from top to bottom - one strip on the right and one on the left side of the flag. Draw out the lines for your stripes. Leave approximately 1/2 of the top 7 stripes empty on the left for your blue section. I started using this paper strip method with this flag after I made about 12 mistakes on my measurements and markings for the stripes. I found it to be a really good way to make certain all my measurements were correct before they get on the flag face. Also if you end up making another flag the same size you can just re-use the strips. Draw out your blue section. The height is determined already. The width of the blue is 1/2 the width of the flag. This is something I got wrong in the past. But I got my fabric flag out and the blue was fully half.of the flag. Mark off the blue area on the flag. Divide the width of the blue by 6. This is the width of the markings you will put on your strip of paper. You will actually have 5 lines on the paper strip. Draw the 5 lines down throughout the blue section. Divide the height of the blue area by 9. This is the height of the rows that you place your stars in. Tape a strip from top to bottom of the blue area and mark sections. There will be 9 sections and 8 lines. Draw the lines across the entire blue section. You now have a grid that will help you place your stars. Now you have to find a template for your stars. What I do is find a star on google images, save it to my computer, increase or decrease the size until the star will fit into one of the spaces on your grid. It should leave a small amount of space between the top and bottom of the star and the top and bottom lines of your grid. Then I draw it onto a thicker paper, like a file folder, and cut it out. This is what I trace to create the 50 stars. Now complete the rows of 6 by centering the star template between the horizontal lines and the vertical lines of each square on the template. You can also use the other stars to balance out where the other stars should be drawn. Paint blue area with your selected blue. Do not paint over the stars. Leave them empty. While the blue dries tape off the edges of the red stripes. The red stripes start at line one and continue on every other row through the last row. Paint the red stripes. While the red paint dries paint the white stars. Make them as perfect as you can, but don't worry too much about it because once you have distressed the flag you won't be able to tell where you messed up. Remove the tape from the lines of red and place tape over the red paint to paint the white stripes. I usually just reuse the tape by using the other side of the tape - the one that didn't get painted on. Keep sanding until you get the look you want. Wipe the whole flag down. 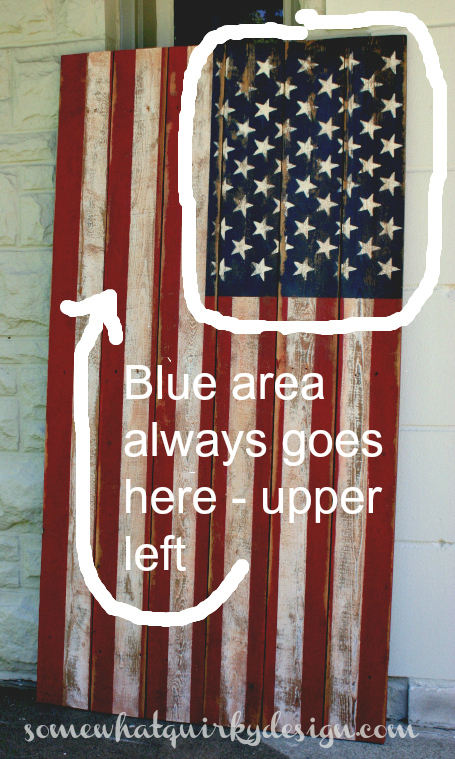 NOTE: When I made the first flag I used mainly chalk paint. This flag was made with acrylic paint. The acrylic paint was MUCH more difficult to sand and get the look I wanted. 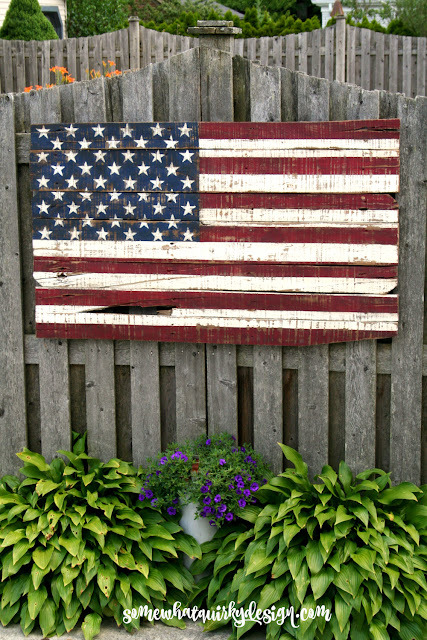 Use a brown glaze or toner over the entire flag. 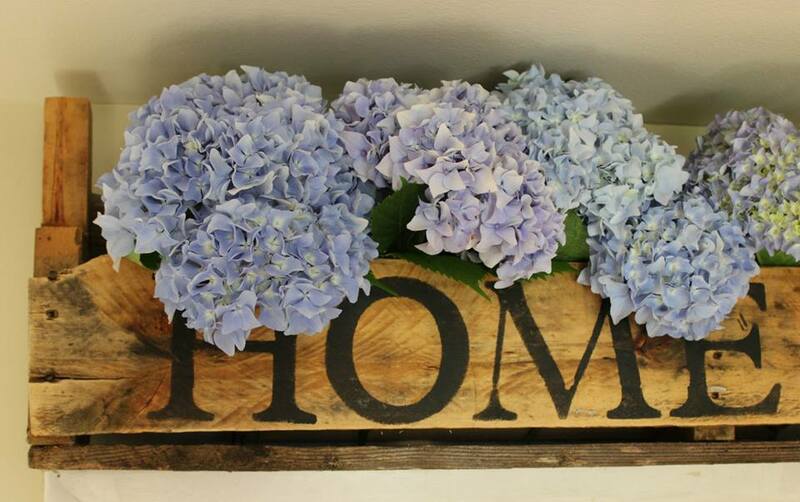 Just paint it on with a chip brush and wipe off with a damp cloth. 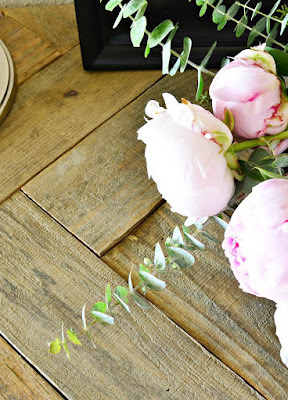 This can also be done with a wood stain, but the effects will be more dramatic, so be careful. Seal the flag with an outdoor sealer If you will be using the flag indoors you can use a dark wax over the piece and have no need to use a sealer. If you will be hanging the flag use heavy duty hanging wire with eye hooks to make the hanger. 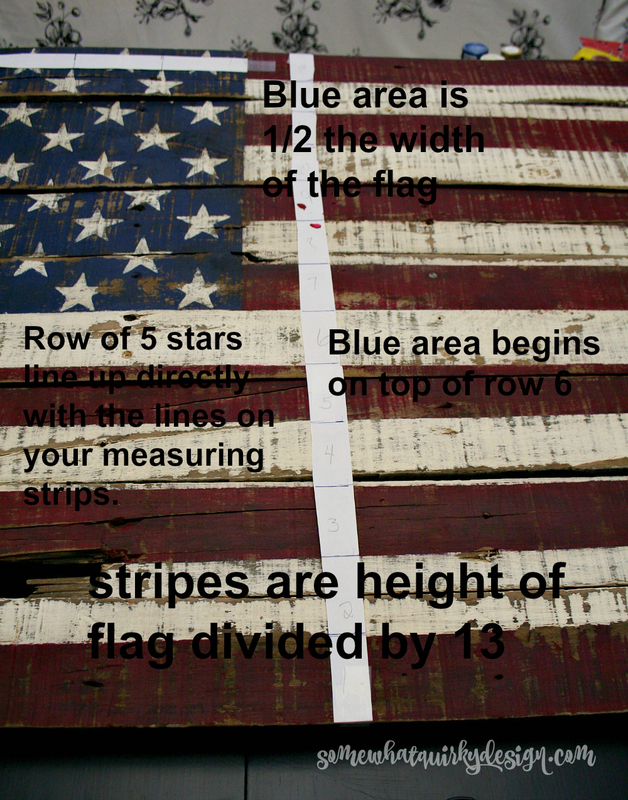 Are you confident enough to make a flag? Maybe you should check out the other tutorial? I mean, it's good enough for hundreds of people a day, why wouldn't it work for you??? 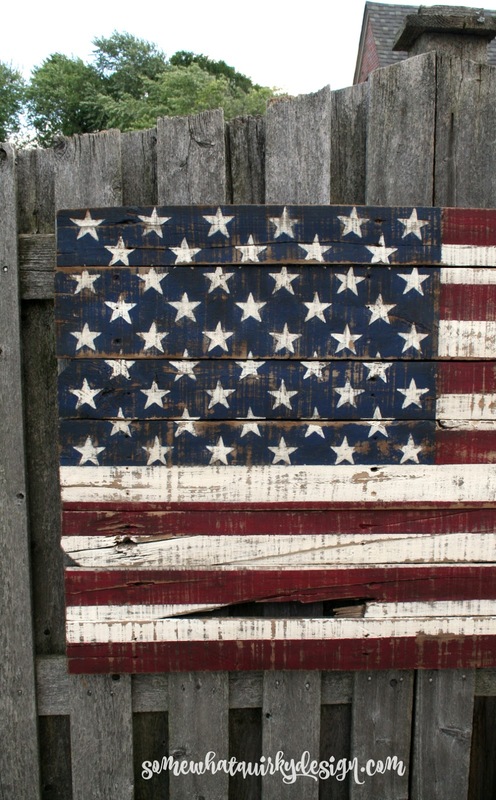 NOTE: When I made my first flag I wanted to use it vertically - to sit on my porch whenever I needed a flag. It was my intention to use it horizontally and vertically depending on where it was being used. But, alas! Flag etiquette does not allow for the blue area to be on the right. It must always be on the left. This works well with a fabric flag when you can turn the flag and reverse it so that the stars stay left. In the meantime, this flag is for sale at Mimi LaRou Designs, in Roseville, MI. And before I introduce you to my fellow pallet Project Challenge friends here are the paints I used for my project. These are affiliate links. Are your kids in martial arts? You might want to try making this belt display made by Emily @ Domestic Deadline. Isn't the ruggedness of this shelf mixed with the beauty of the hydrangeas lovely? 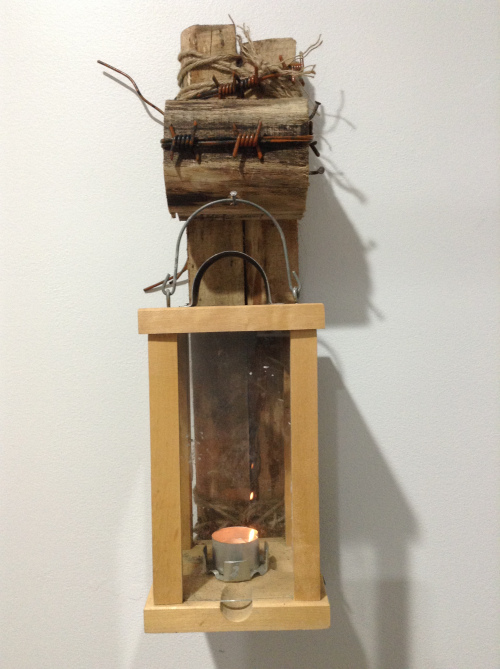 It's from Michelle @ Shellstring. And don't forget to make your flag for the holiday! But if not before the holiday, ENJOY!!! I'll be here eating brisket. My son just asked me to put an American flag in his bedroom, I'm going to have to make him one of these! 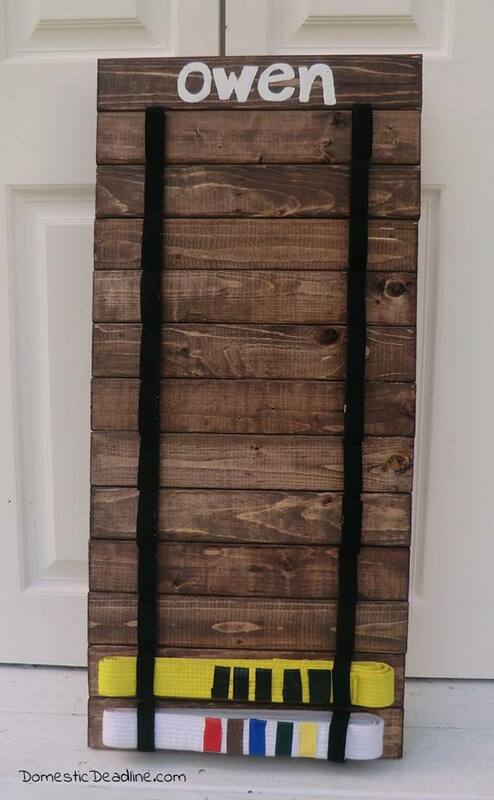 It can go next to his belt rack, lol! What a great project! (Hi btw. It's been awhile 😊) This is a great tutorial...the tip on using a strip of paper to mark the lines is genius! I have pickets...might have to attempt one. 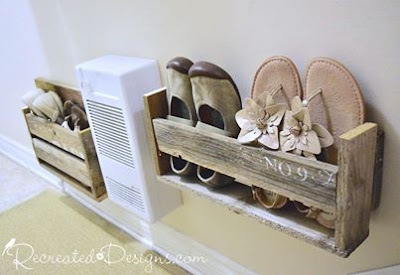 The other project that caught my eye was the shoe rack! That would be handy! Hope your summer is going well. Have i told you lately what a nice big flag you have? I need to make an American flag. 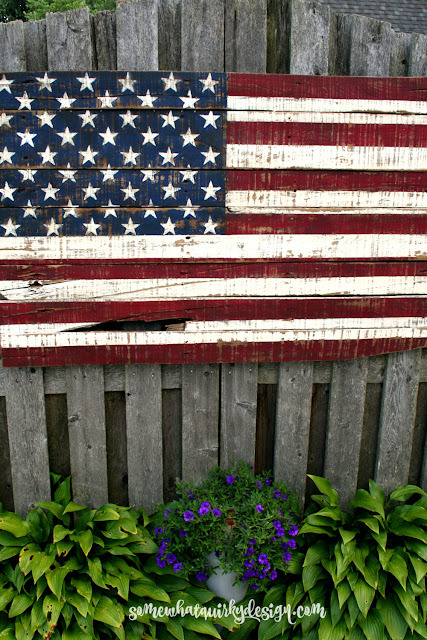 I had a wooden colonial flag hanging on our fence, but it fell apart. What is the height and width of your flag? Hah! I'm so sorry, but I don't know! I sold this one. It was the full width of a pallet. The height was, it looks like, 7 boards. The boards appear to be different widths. I usually just lay out boards until they look to be the right size. For example, it some of the boards in this flag hadn't been wider, it probably would have taken another board. Some other national flags are harder to make. Love the look. My only note is you have too many stars.